QVC is once again teaming up with Ovarian Cancer Research Fund (OCRF) to broadcast QVC Presents Super Saturday Live from the Hamptons. The special two-hour designer charity sale, which is scheduled to air starting at 2 p.m. will feature fashion, beauty, jewelry, accessories and home pieces at HALF the manufacturer’s suggested retail price* with net proceeds benefiting OCRF. Select brands scheduled to be featured include Laura Geller, Peter Thomas Roth, L’Oréal Paris, Philosophy, Judith Ripka, Amrita Singh, Honora and B. Makowsky. Additionally, contemporary sportswear line. Tart Collections is scheduled to unveil its Infinity Dress in a brand-new teal color, especially designed to support ovarian cancer research and education. Currently in its 14th year, Super Saturday will broadcast live for the fifth consecutive year on QVC. We’ve previously noted that Arnold Scaasi’s HSN fashion jewelry line is lovely and inexpensive. But Scaasi has the personality of crab on-air. Maybe he will be in a better mood now that New York has legalized gay marriages. The wedding was set for this week, according to Page Six, with 75 supposed to attend the soiree at Le Cirque. Scaasi, who is 81, is legally settling down with Ladd, who is a former Scribners editor and VP of Literacy Partners, according to Page Six. Nasty Gawker made good fun of Mariah Carey’s HSN appearance last night. Carey certainly had her moments, which we referenced in our blog, but we didn’t think it was that bad. Gawker edited Carey’s two-hour appearance into four minutes, and made her look ridiculous. You edit anyone’s two-hours down to four minutes, and you can make them look silly. Mariah Carey hasn’t been seen much since giving birth to twins in April, so people were especially curious on Sunday night ahead of her appearance on HSN to hawk everything from her fragrances to her jewelry. And by God, she delivered. Singer Mariah Carey was back for a second stint on HSN, debuting her apparel line during her visit Monday. The last time Carey was on, in the spring, she was not that far from the delivery date of her twins, who were born April 30 (her wedding anniversary and just two days after our April 28 birthday). She looked really uncomfortable (“I couldn’t stand by myself”) because of her pregnancy, and she was selling her fragrance, costume jewelry and shoes. It just struck us as a little odd, and she used the term repeatedly. She had HSN’s Today’s Special, which are pave hoops with butterfly and circle charms, for $40. We thought she was at her best when her husband, Nick Cannon, showed up on the set briefly. “She’s my dream girl,” Cannon said. Now there’s a good husband for you. 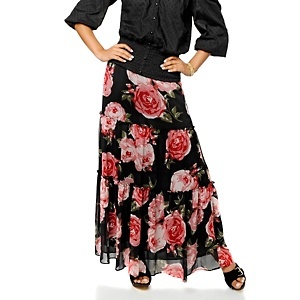 Some of Carey’s HSN clothing included a smocked top, in either a big rose floral print or a black bandana print, with a matching chiffon skirt. We were a bit surprised to see Carey paired with HSN host Adam Freeman. He usually does the morning shows, not midnight. Nice try Adam. You’re a day late and a dollar short. Carey also did an updated version of a sweat suit with a hoodie, which seemed a little ho-hum and too Juicy Couture for us. Did Marc Anthony Move Out When Jennifer Lopez Was In Florida On HSN? Needless to say, we’ve been reading everything we can about Jennifer Lopez’s split with Marc Anthony. We can’t remember where we read it, but one magazine said that Anthony moved all his stuff out of the couple’s Long Island home on July Fourth weekend. Where was Lopez? As any HSN fan knows, Lopez was in Florida appearing on the home shopping network to hawk her new perfume. She was there the late night of July 1 to July 2. Her mom was with her, and Lopez never mentioned Anthony, although she gushed about their twins. We hope she didn’t get back from her HSN appearance to find that her hubby had flown the coop. ShopNBC’s Beauty Day: Fall Preview Event is next Wednesday. That may be hard to think about if it’s still 103 degrees out next week. “Discover your next beauty secret with over 45 new items and returning customer favorites,” ShopNBC says. Keratin Earth: Keratin Earth employs a unique combination of ingredients to safely deliver straight hair while minimizing damage. All straightening products for the hair make use of a similar 3 step regimen – hair is softened and stretched, structurally rearranged, and then set into place. Glam Glow Exfoliating Mud Musk: Designed as a ‘facial in a jar’ for backstage use in Hollywood’s Entertainment, Music, Fashion & Award industries, for behind-the-scenes ‘immediate’ camera-ready glowing skin. GLAMGLOW’s mud base is from Southern France, home to glamorous Cannes, St. Tropez and Monaco. Use a couple of times a week or simply when you need GLAM-tastic skin in 10 minutes or less. Ramona Cline Intensive Eye Treatment: A must have! This Intensive Eye Serum contains Spin Trap liquid crystal which effectively absorbs onto the skin to moisturize, strengthen and helps protect the sensitive eye tissue. Spin trap has been touted as the next generation of anti-aging skincare systems. Happy Birthday With The Angels, Jeanne Bice! Today is QVC Quacker Factory queen Jeanne Bice’s birthday. It was heart-warming to look at her Facebook page and see everyone wishing her happy birthday in heaven. From what we understand, it would have been her 72nd birthday. With your warm and caring personality, we should have known you were a Cancer, Jeanne. It also happens to be the birthday of QVC designer Chloe Dao. We were out all Saturday and didn’t get home until 10 p.m., to find out that one of the biggest stories this year about QVC had already broken, making headlines across the country. Actress and former anti-Vietnam war crusader Jane Fonda was scheduled to appear on the home shopping network to promote her new book. But QVC apparently bowed to right-wing pressure and cancelled her appearance, according to the actress and fitness maven. Fonda did not take the matter lying down. She posted an angry blog about what happened, which was picked up by the press. I was to have been on QVC today to introduce my book, “Prime Time,” about aging and the life cycle. The network said they got a lot of calls yesterday criticizing me for my opposition to the Vietnam War and threatening to boycott the show if I was allowed to appear. I am, to say the least, deeply disappointed that QVC caved to this kind of insane pressure by some well funded and organized political extremist groups. And that they did it without talking to me first. I have never shied away from talking about this as I have nothing to hide. I could have pointed out that threats of boycotts are nothing new for me and have never prevented me from having best selling books and exercise DVDs, films, and a Broadway play. Most people don’t buy into the far right lies. Many people have reached out to express how excited they were about my going onto QVC and hearing about my book. Bottom line, this has gone on far too long, this spreading of lies about me! None of it is true. NONE OF IT! I love my country. I have never done anything to hurt my country or the men and women who have fought and continue to fight for us. I do not understand what the far right stands to gain by continuing with these myths. In this case, they denied a lot of people the chance to hear about a book that can help make life better, easier and more fulfilling. I am deeply grateful for all of the support I have been getting since this happened, including from my Vietnam Veterans friends. Frankly, we think Fonda has apologized for her disgraceful action during the war, and people should let it rest: Unless, as the Bible says, they are without sin. Then they can feel free to cast the first stone. Here’s a shocker: Just two weeks after her live appearance on HSN to hawk her new perfurm, Jennifer Lopez announced she and Marc Anthony are divorcing! To us, she showed no sign of being under strain or being unhappy. She happily talked about the twin she and her husband had. But now that we think about it, we can’t remember her talking about Anthony. BTW, this is our 1,000th Homeshoppingista blog. You are currently browsing the Homeshoppingista's Blog By Linda Moss blog archives for July, 2011.